American Institute of Mediation, AIM Institute: Our Mission. Why we’re not just another mediation training institute. Offering a unique and diverse curriculum whose sole purpose is to raise a mediator's level of practice, the AIM Institute is where leading mediators turn to continue their learning and career development. Being free of academic constraints and embracing other disciplines allows AIM to expand the frontier of this developing profession. The American Institute of Mediation (AIM) is committed to raising the level of practice throughout the field of mediation. The measure of our success is the extent to which the mediators who attend our courses are more effective and successful. 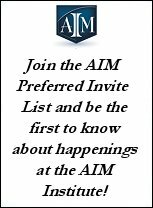 The AIM Institute distinguishes itself in the marketplace for mediation, negotiation, conflict resolution and peacemaking training by attracting the most talented and successful trainers to create cutting-edge courses that they are most passionate about, offering attendees the courses that the experts in the trenches deem most valuable. Obtaining a certificate from the AIM Institute brings immediate credibility, opening doors to successful individual practices, commercial panels, and peacemaking work around the world. AIM is a community where trainers thrive and synergize, and mediators connect, learn and gather to discuss the field’s growth and development.